Amit Electrical manufacture supplier and exporter of Brake Rectifiers. With a precise understanding of the modern market trends, we introduce ourselves as the leading provider of Brake Rectifier to the customers. Being a quality-oriented organization, we ensure our valued clients that these products are the finest in quality and find usage in different industries. Additionally, the offered products are manufactured using high grade materials and are widely appreciated in the industry for its sturdy design. Clients can avail these products at budget friendly prices from us. Amit Electricals manufacture supplier and exporter of Brake Rectifiers. With a precise understanding of the modern market trends, we introduce ourselves as the leading provider of Brake Rectifier to the customers. Being a quality-oriented organization, we ensure our valued clients that these products are the finest in quality and find usage in different industries. Additionally, the offered products are manufactured using high grade materials and are widely appreciated in the industry for its sturdy design. Clients can avail these products at budget friendly prices from us. 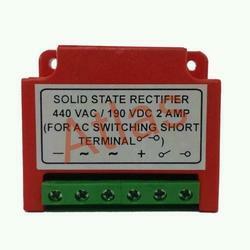 Looking for Brake Rectifier ?